No one fully understands the underlying physics of the purple ribbon. However, one of the European Space Agency’s Swarm satellites recently flew overhead while Steve was active, providing some clues. Steve’s visit to Alberta on May 20, 2017, coincided with another exotic auroral form: the green “picket fence.” These vertical rays are thought to trace lines of magnetic force connecting Earth to space. 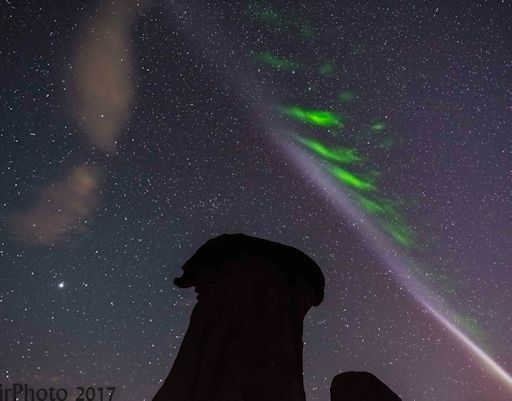 Luminous green columns show where beams of energetic particles are being guided toward Earth’s upper atmosphere by magnetic fields. Both Steve and the picket fence are filamentary structures associated with beams or ribbons of gas. Coincidence? Hardly. Pictures of the two phenomena show that they often appear together. Consider it another clue. 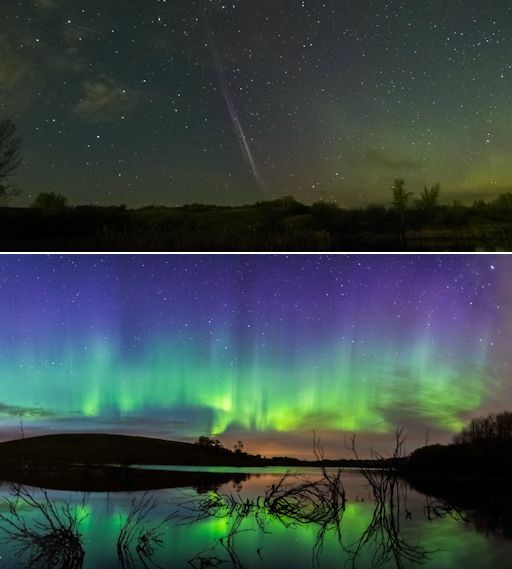 “Steve hung out with me for about 15 minutes on May 17th,” reports photographer Harlan Thomas, who witnessed a spectacular display of auroras over Twisted Ponds. The lights appeared as Earth moved through a stream of fast-moving solar wind that briefly interacted with our planet two days ago. Steve is still a mystery. No one fully understands the underlying physics of the ribbon. However, one of the European Space Agency’s SWARM satellites recently flew overhead while Steve was active, providing some clues. During strong geomagnetic storms, the outer radiation belt expands, causing the killer electrons to approach Earth. 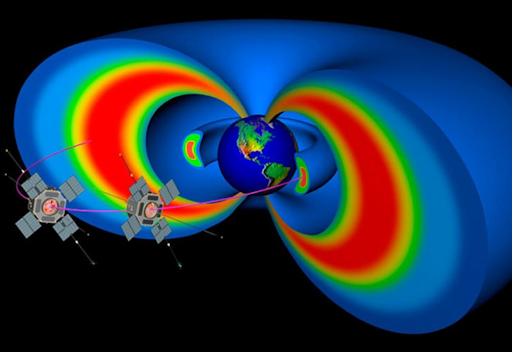 But NASA’s Van Allen Probes, a pair of spacecraft sent to explore the radiation belts, found that something was stopping the particles from getting too close. 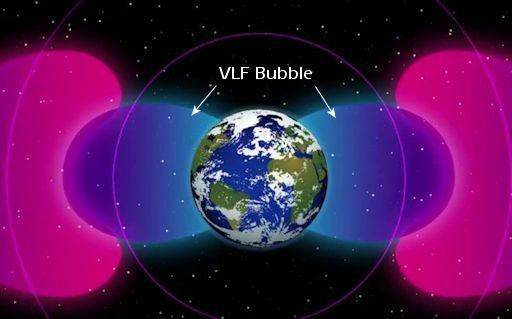 “Because powerful VLF transmitters have been operating since before the dawn of the Space Age, it is possible that we have never observed the radiation belts in their pristine, unperturbed state,” notes the team, which includes John Foster, a colleague of Erickson at MIT and a key leader of this research, along with Dan Baker at the University of Colorado Boulder. Other anthropogenic effects on space weather include artificial radiation belts created by nuclear tests, high-frequency wave heating of the ionosphere, and cavities in Earth’s magnetotail formed by chemical release experiments. Download the complete paper here. 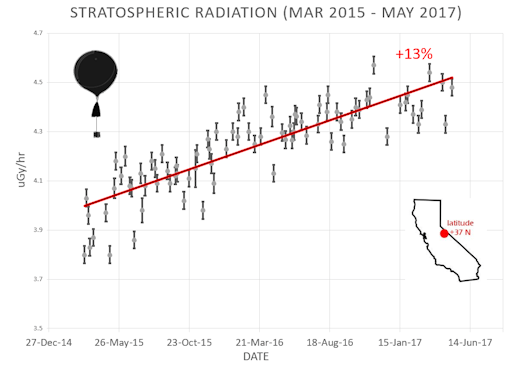 The data show cosmic ray levels intensifying with an approximately 13% increase since March 2015. Cosmic rays are high-energy photons and subatomic particles accelerated in our direction by distant supernovas and other violent events in the Milky Way. Usually, cosmic rays are held at bay by the sun’s magnetic field, which envelops and protects all the planets in the Solar System. But the sun’s magnetic shield is weakening in 2017 as the solar cycle shifts from Solar Maximum to Solar Minimum. More and more cosmic rays are therefore reaching our planet. How does this affect us? Cosmic rays penetrate commercial airlines, dosing passengers and flight crews enough that pilots are classified as occupational radiation workers. Some research shows that cosmic rays can seed clouds and trigger lightning, potentially altering weather and climate. Furthermore, there are studies ( #1, #2, #3, #4) linking cosmic rays with cardiac arrhythmias in the general population. The sensors we send to the stratosphere measure X-rays and gamma-rays, which are produced by the crash of primary cosmic rays into Earth’s atmosphere. The energy range of the sensors, 10 keV to 20 MeV, is similar to that of medical X-ray machines and airport security scanners.